After three years, electronic information exchange between tax offices and land registration offices has fundamentally changed professional processes, enhanced the effect and efficiency of procedures for land users, said participants in the review conference on “Pilot implementation of electronic information exchange between tax authorities and land registration agencies when determining financial obligations of land users in 2015 - 2018 phase” held in Hanoi on October 4, 2018. Mr Nguyen Dai Tri, Deputy General Director of the General Department of Taxation, said that information transmission between tax authorities and land registration authorities was manual in the past, without proper inspection and close information connectivity among relevant bodies, resulting in time-consuming and personnel-consuming procedure settlement as well as errors and omissions in calculation. 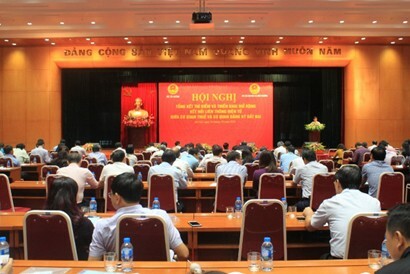 To deal with these issues, in 2015, the Ministry of Finance and the Ministry of Natural Resources and Environment jointly piloted the electronic communication exchange between land registration offices and tax offices in eight provinces and cities: Hanoi, Ho Chi Minh City, Vinh Long, Binh Duong, Hai Phong, Da Nang, Ba Ria - Vung Tau and Tra Vinh. Electronic information exchange has brought very positive results. Accordingly, for people, the time required for settling procedures reduced from 5 working days to 3. For authorities, the new approach fundamentally changed information exchange procedures when defining financial obligations, enhancing the effect and productivity of land procedure settlement. For society, this method has formed a transparent, friendly, accommodative and innovative administration. Some provinces completed this method and their rate of land registration applications received and resolved by means of electronic information exchange is high. In Binh Duong province, all nine district-level locations have applied this approach. 65.3 per cent of documents are electronically exchanged, including 82.95 per cent having results returned electronically. In Da Nang, seven out of eight district-level areas have adopted this, with 85.61 per cent of documents electronically exchanged, including 98.4 per cent having results returned electronically. In addition to eight pilot provinces and cities, the General Department of Taxation and the General Department of Land Administration also supported Ben Tre province to carry out this electronic communication model and successfully deployed in all nine districts in June. In July and August 2015, as many as 10,836 electronic records out of 11,805 records were transferred, a rate of 91.97 per cent. At present, some provinces proposed the General Department of Taxation and the General Department of Land Administration for support to launch electronic information exchange models. Proposers included Dong Thap, Long An, An Giang, Binh Thuan, Dong Nai, Lam Dong, Hue, Ca Mau, Dak Lak, Tien Giang and Phu Yen. Despite good initial results, participants to the conference also pointed out that the process of connecting information exchanges exposed shortcomings resulting in amphibious pilot process of using both manual and electronic methods at the same time. This took more time from citizens. Various software used by resource and environment agencies also disrupted exchange information applications. For instance, according to the law, the time for settling procedures on land price options for direct comparison, income, withholdings and surpluses, the Provincial/Municipal Departments of Natural Resources and Environment shall work out land price plans to be sent to the Local Land Price Appraisal Council chaired by the Department of Finance for appraisal and forwarded to the Provincial People's Committee for approval of specific land prices. But, there is no time limit for fulfilling this work, resulting in prolonged settlement of this work and slowing the formation of land tax exemption, particularly for one-off land rent payment. In order to solve this issue, the General Department of Taxation suggested that the Provincial People's Committee and the Department of Natural Resources and Environment have regulations on forming a lead agency to connect applications with tax offices to facilitate document exchange. At the same time, it is necessary to set the time frame for settling these procedures in order to collect land-related funds for the State Budget. Target of 1 Million Businesses by 2020: Will It Be Feasible?